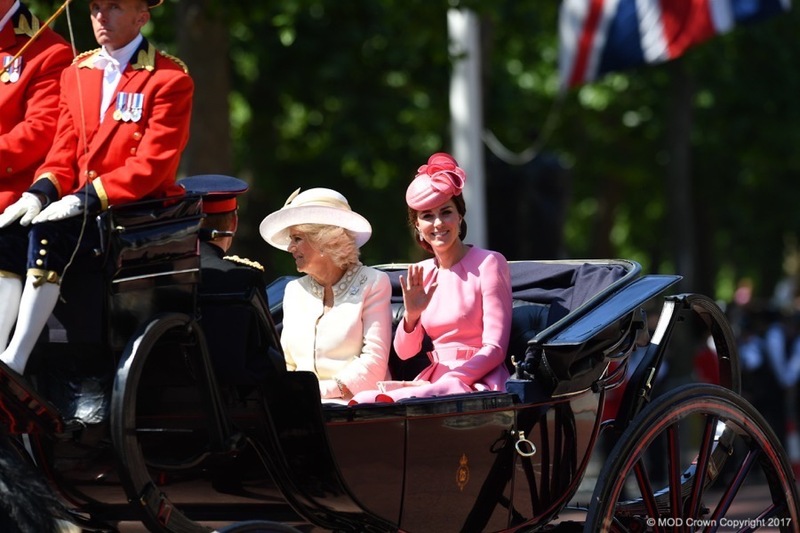 On the 17th of June 2017, the Duchess of Cambridge (Kate Middleton) attended her seventh Trooping the Colour Parade. 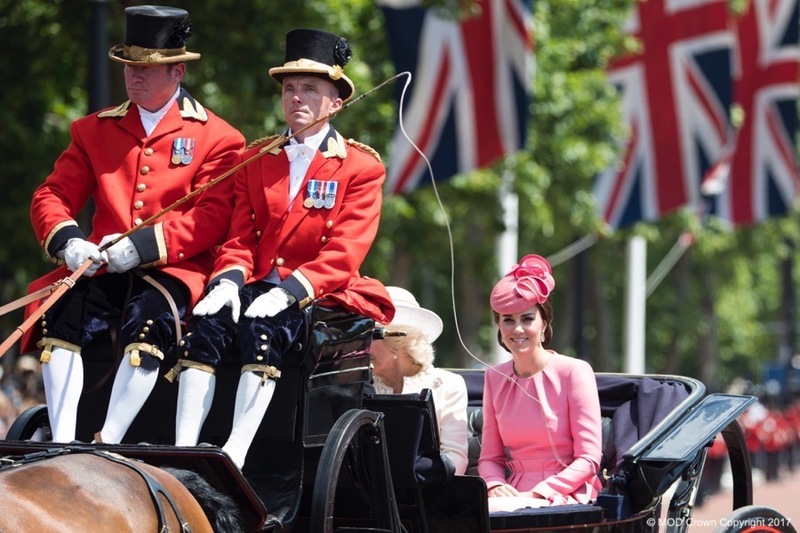 Kate has not missed a parade since marrying Prince William in 2011 (Click here to view all previous Trooping the Colour coverage). 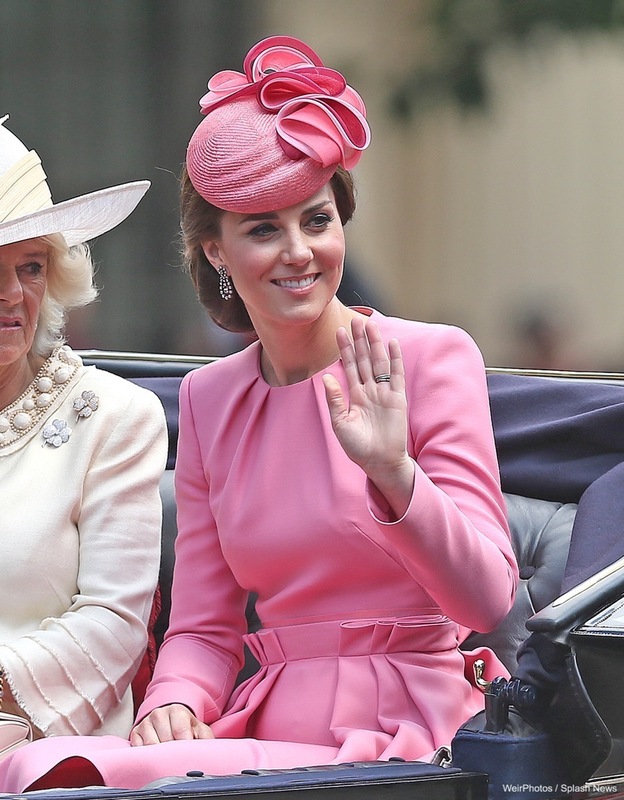 Each year, Kate sits in a carriage alongside the Duchess of Cornwall and opposite Prince Harry. 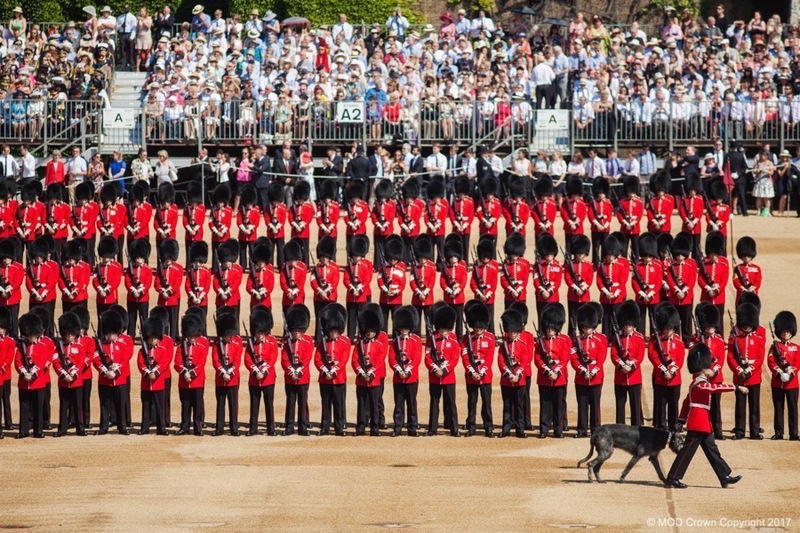 Trooping the Colour is an annual military parade that takes place on Horse Guards Parade in London. 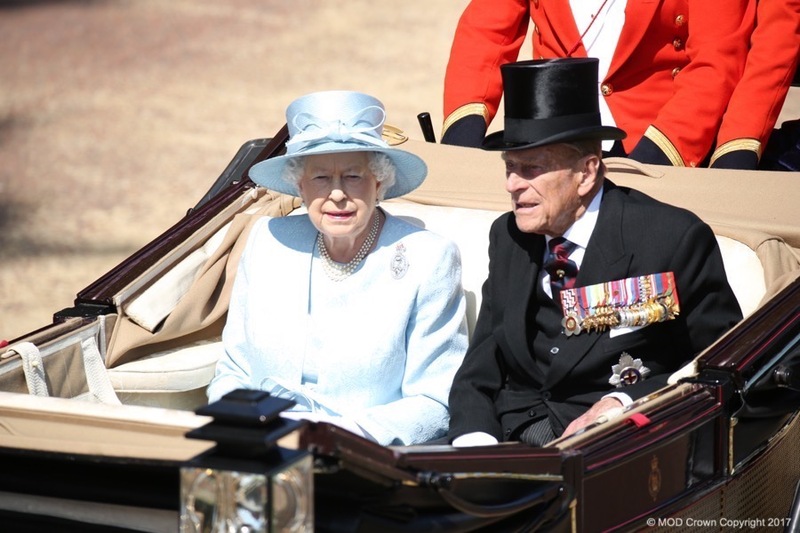 The parade marks the Queen’s official birthday. Over 1,400 offers, 200 horses and 400 musicians take part. It’s quite a spectacular display. 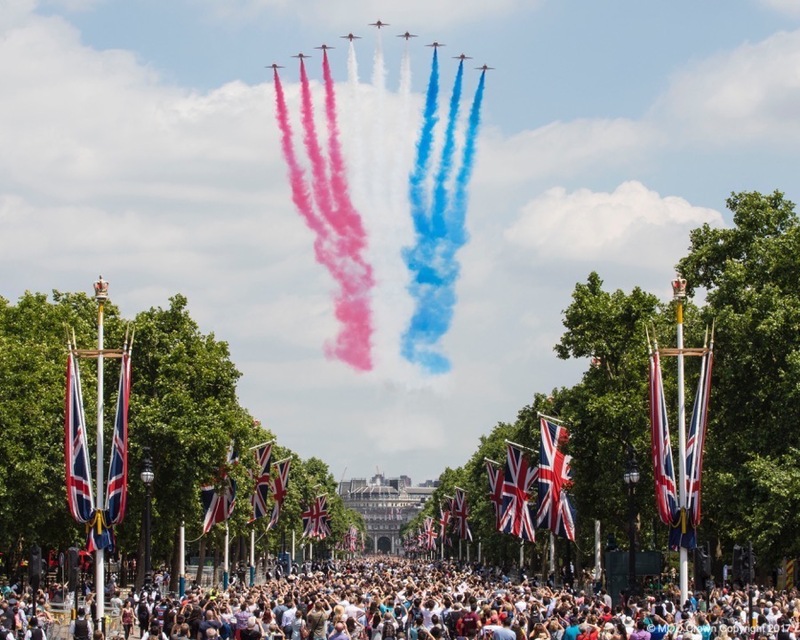 After the parade, the Royal Family stand on the Balcony at Buckingham Palace to watch the British Air Force perform a traditional “flypast” – a ceremonial or honorific flight carried out by a group of aircraft. 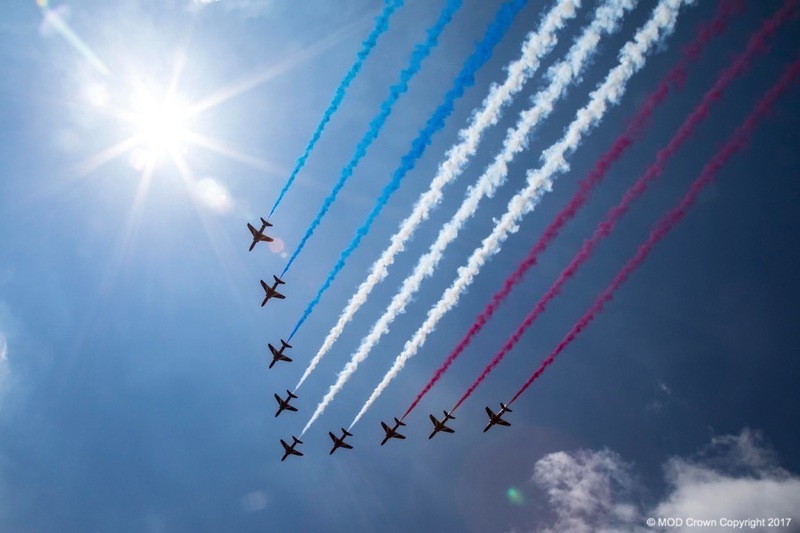 The Royal Air Force Aerobatic Team (RAFAT) and The Red Arrows both took part in the flypast. 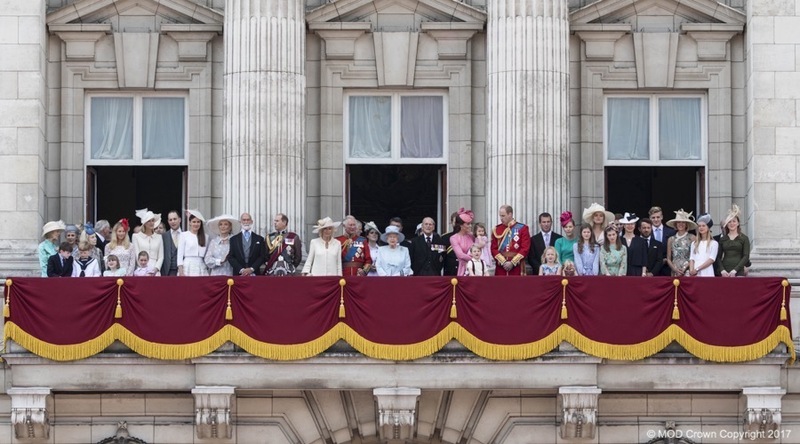 The Royal Family joined the Queen on the balcony at Buckingham Palace. 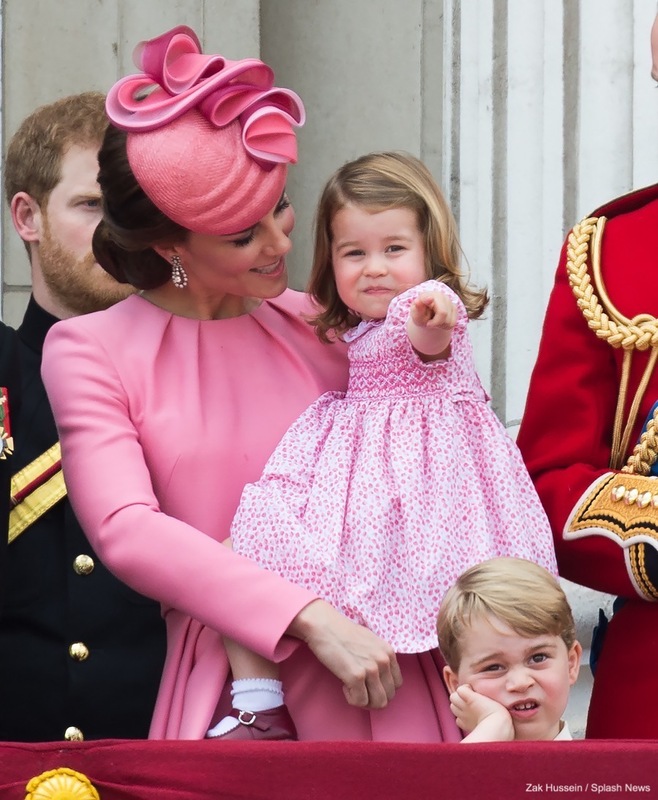 Of course, Prince George and Princess Charlotte were in attendance too. Prince George didn’t look too excited at first! 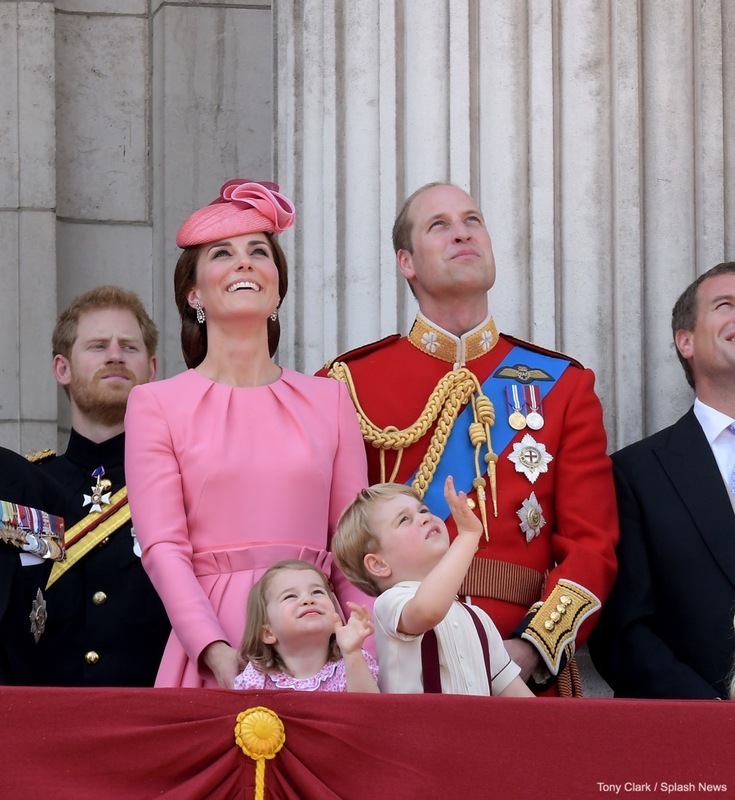 As the aeroplanes and helicopters flew over the building, George and Charlotte looked a little happier – both children started waving. 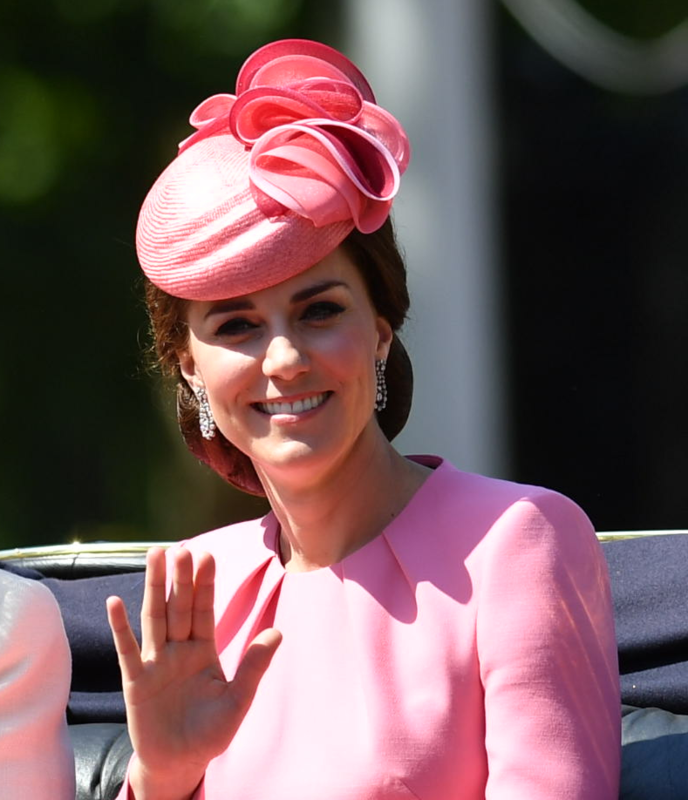 Kate wore an eye-catching pink dress for the Trooping the Colour celebrations. It’s a custom piece by Alexander McQueen. Kate appears to be wearing a modified version of the dress, with added sleeves and a longer length skirt. FarFetch.com described the pink dress as a “pleated skirt skater dress”, while Neiman Marcus stocked the blue version and described it as a “sleeveless paperbag-waist mini dress.” Both dresses were made from a silk-wool blend fabric. Huge thank you to Michelle from Perth Fashion for sharing the links with me. 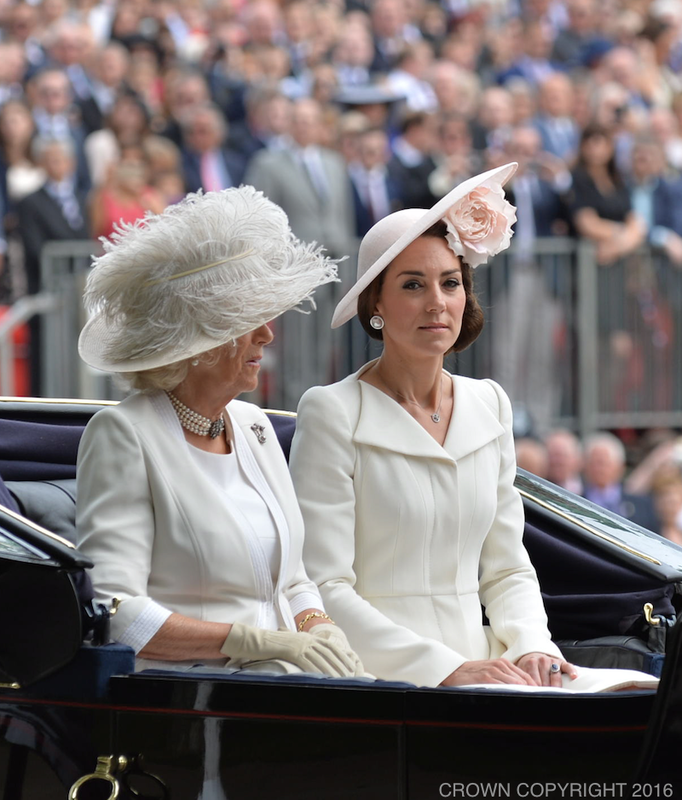 My friend Anna received confirmation that Jane Taylor designed Kate’s hat. [A] vibrant new cocktail percher hat with moulded pink straw button base trimmed in draped and looped bows in three layers of crin, each in a different shade of pink. This cascading crin bow trim gives wonderful movement and drama to the piece and the contrasting colours (especially the darker plum) lends depth and punchy contrast. 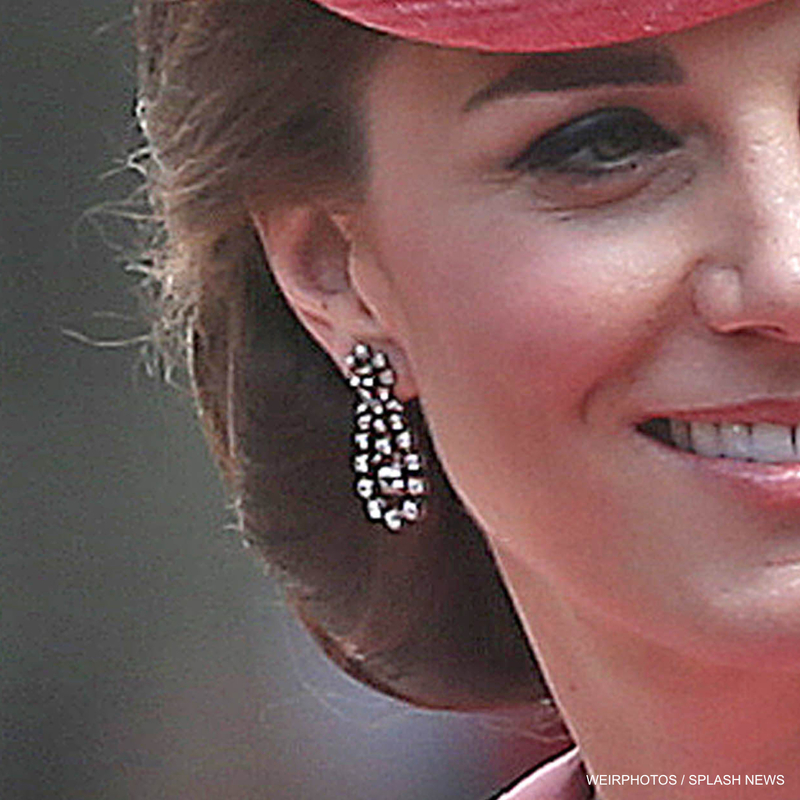 Kate’s diamond drop earrings are on loan from the Queen. 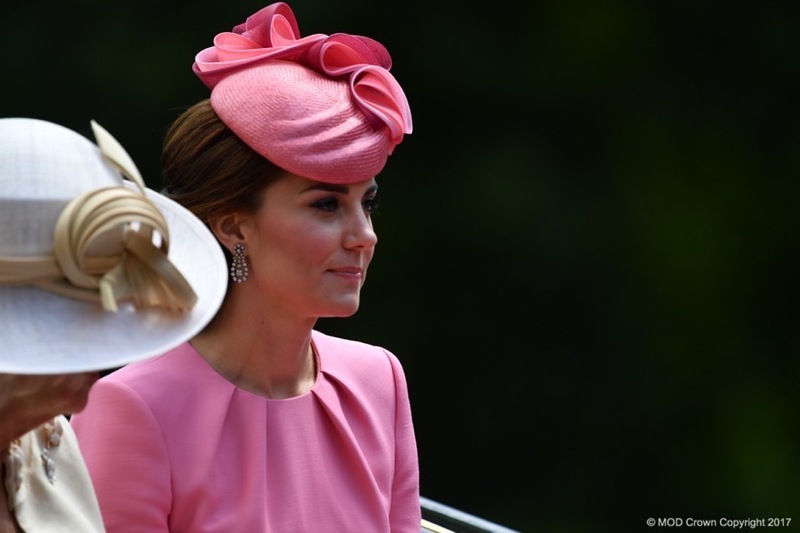 Kate first wore them to a diplomatic reception back in 2016. The Queen wore them to the State Opening of Parliament in 2012 – but unfortunately, little more is known about the spectacular earrings. Any idea on where Princess Charlotte’s dress is from? Sadly not! It’s so pretty, isn’t it?